Francois Faton Cahen - "Great Winds"
It seems that Musea is branching out into all sorts of directions these days. 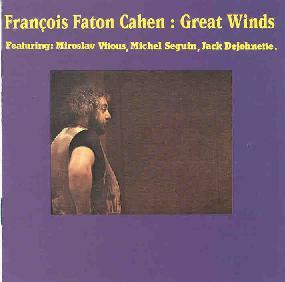 This reissue of Francois Faton Cahen's 1979 Great Winds album is the first on Musea's new, aptly titled, Great Winds division. Cahen had earlier played with Magma and Zao, and on Great Winds is joined by Wheather Report bassist Miroslav Vitous, percussionist Michel Seguin, and (on two tracks) drummer Jack Dejohnette. Easily my favorite tracks are "Alize (Trade Wind)" and "Oriental Wind". "Alize" includes gorgeous piano runs, steady percussion, and Vitous' most welcome stand-up bass. The music is based in jazz but Seguin's percussion adds an element of African and related rhythms to the mix. The music alternates being intense, even frantic, and quietly melodic. Cahen's piano is at the forefront, but Vitous and Seguin are by no means serving a mere rhythmic role, especially Vitous who handles more than his share of leads. "Oriental Wind" starts with a slow, but passionate, buildup by all three musicians, Vitous' bass functioning almost single-handedly as a string symphony. True to the song's title, Vitous gives the music an Eastern flair, and a fiery one it is. The trio work themselves into a frenzy, only to just as quickly ease the pace. Yet one of the band's strong points is that fast or slow, the intensity level rarely subsides. A powerful musical statement that left me breathless. "Zephyr" is an easier paced, somewhat more 'fluffy' track, quite beautiful but less than satisfying after the roller coaster ride of "Oriental Wind". On "Spirit Of The Wind" things get interesting again. Written by Seguin, the song feature more African rhythms, this time very much in the forefront. Vitous cranks out exploratory leads while Cahen plays a support role that helps flesh out this percussion driven tune. "Whirlwind" is a track that could have just as easily been titled "Solo Bass Orchestra". Vitous handles solo what many string quartets struggle to accomplish as an ensemble. A killer classical workout. "A Froggy Day" and "Chapel Of The Wind" are the two tracks where the trio is jointed by drummer Dejohnette. Both are cool jazz workouts given more of a band feel with the addition of the drums. But in the end I found these to be a bit too jazz standard and lacking in the individual marks made by the trio as individuals on the other tracks. As a trio, the music is far more interesting and worthy of reissue. And as those represent the bulk of the music on this CD I give this an enthusiastic thumbs up. Great Winds is distributed by Musea Records. You can visit their web site.